RAMPs is the simplest and the most used controller board for RepRaps. Our RAMPS boards are made of high quality, double layered PCB, have 35V capacitors and come with all jumpers installed. Other components used in our RAMPS are of high quality, which make it more stable and gives higher print quality. Here at 3dprintronics all the boards are first tested for full functionality and only after passing quality check are dispatched to our customers. 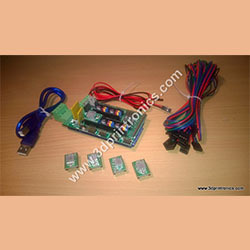 This kit comes alongwith proper documentation which explains how to go about connection various components on to RAMPS. RAMPS - RepRap Arduino Mega Pololu Shield board. This is version 1.4 of the shield, designed to drive a RepRap from an Arduino Mega. It uses Pololu Stepper Drivers delivering up to 1/16 microstepping. Four drivers are needed to move most 3D printers, with 3 going to the axis & one driving the extruder. An optional fifth stepper driver socket has been provided for additional applications like a dual extruder. Additional information and sources at RepRap.org/wiki/RAMPS. This board is Open Source Hardware licensed GPLv3. Integrated Heated bed control with 11A fuse. 6 sets of Digital Pins in headers with VCC and GND for endstops (prewired mechanical endstops included with this kit). Uses pluggable screw terminal block for power connection. Extra pins broke out : PWM, digital, serial, SPI, I2C and analog. Use of widely available, low cost, high quality RC servo connectors for interconnects. Arduino MEGA (included) and Pololu Stepper Drivers (04 included) easily removable for reuse at RAMPS end of life.